A gift from my good friend Joyce. I started reading it during our trip in Kuching and I’ve to say I had a lot of fun reading it. 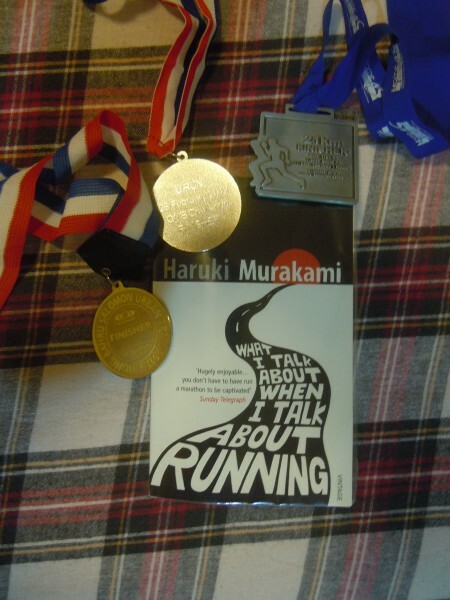 I am not very sure if it was because I do run a lot and I participate in races as well or it is, by itself, with or without running experience, a fun book. I’d like to think it’s the latter. “I’m the type of person who doesn’t find it painful to be alone. I find spending an hour or two every day running alone, not speaking to anyone, as well as four or five hours alone at my desk, to be neither difficult nor boring.” Pg 15 – I, too, don’t find it difficult. At some point its actually enjoyable and I find myself more productive having these moments. “I had to give it everything I had. If I failed, I could accept that. But I knew that if I did things half-heartedly and they didn’t work out, I’d always have regrets.” Pg 31 – on closing his bar and focusing on writing. “Most runners run not because they want to live longer, but because they want to live life to the fullest. If you’re going to while away the years, it’s far better to live them with clear goals and fully alive than in a fog, and I believe running helps you do that. Exerting yourself to the fullest within your individual limits; that’s the essence of running, and a metaphor for life – and for me, for writing as well. I believe many runners would agree.” Pg82-83 – I completely agree. “If you’re a long distance runner who trains hard every day, your knees are your weak point. Every time your feet hit the ground when you run, it’s a shock equivalent to three times your weight, and this repeats itself perhaps ten thousand times a day.” – pg 127 – I experienced pain on my right knee during one of the runs early this year. I was able to finish the race but got scared as hell that I would never be able to run painlessly again. Luckily, after some training, subsequent runs didn’t cause me any pain anymore. “I’ve always done whatever I felt like doing in life. People may try to stop me, and convince me I’m wrong, but I won’t change.”- pg150 – something I’m trying to work on to..I want to be like this!